Qatar has been in a construction frenzy for the upcoming 2022 World Cup, an event requiring billions of dollars worth of new stadiums and infrastructure, as well as an estimated 1.5 million additional workers. 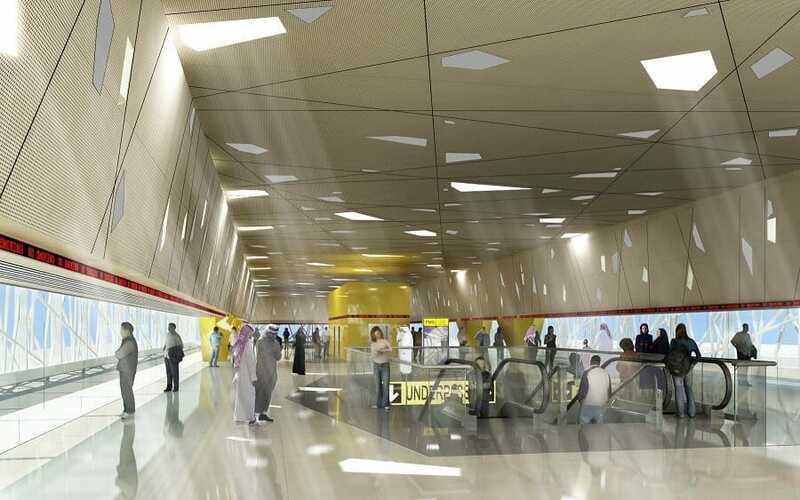 QST and the local integrator won a shootout against Daktronics to secure this project for the new Doha Metro system. With a horizontal resolution of 17000 + pixels, almost 5 times of a 4K resolution, QST was tasked with designing a solution that would display the entirety of the 426 Ft. long ticker as one continuous zone. QST engineers provided 2 design revisions and associated prototypes. We also customized the 4 inside 90 degree mitered corner as well as the 4 outside mitered corner in the “elevator shaft” allowing smooth scrolling of text from one side to the adjacent perpendicular side.